I know this blog is about family friendly meals but I am also going to introduce you to “mommy” meals. Mommy meals are meals that I typically eat for lunch while the kids are in school or on the weekends. Mommy meals are nutritious, whole grain, chock full of vegetable meals. I know most of these meals would not appeal to my kids yet so I eat them for lunch or dinner on those nights where there is an acceptable leftover for them. Anyway, I have had Heidi Swanson’s cookbook, Super Natural Cooking for about a year. I love this cookbook as well as her blog, 101 cookbooks. She is a local gal, just 15 minutes from me (somewhere in SF), so I feel a sort of local kinship with her. This cookbook has so many beautiful recipes and photos that I often just browse through like I would a picture book. My hubby was commenting to me the other day as I was paging through the book, how I still have not made a recipe from it. I told him I have not made anything from it because most of the meals would not appeal to our kids. He told me, in a loving way, to stop with the excuses and just make something from it. He also promised that he would happily eat anything I made from the book. I decided he was right, so I opened up to page 155 and got ready to make Heidi’s chickpea patties that I have been wanting to try for so long. These are not your typical burgers that you put inside a bun. These burgers are the bun! You insert the goodies inside of the burger. Genius! I made these burgers the first time for lunch and they were so tasty that I decided I was going to make them for some friends that were coming over for dinner the next night. We served them up with some Tzatziki sauce (recipe below), fresh avocado, sprouts, chopped tomato and my kale salad. It was a fabulous vegetarian meal! I felt so refreshed and light after eating this dinner, that is until I had a huge piece of chocolate cake, ugh! This is a great do-ahead meal because you can make the burgers, tzatziki yogurt sauce earlier that day or the day before. All you have to do when your guests arrive is heat up the patties and chop up the fresh ingredients to put inside. I wanted to simplify this recipe so I did not get sprouted garbanzo beans nor did I make my own bread crumbs. Sometimes we just have to cut corners and make things easier on ourselves. I kept Heidi’s recipe the way she wrote it below and noted my changes in green. This is a great do-ahead meal; you can store shaped, ready-to-cook patties in the refrigerator for a week’s worth of lunches or dinner. Just cook them up when you are ready to eat them. 2 1/2 cups sprouted garbanzo beans (chickpeas) or canned garbanzos, drained and rinsed – I used the boxed variety and 2 boxes gave me 2 1/2 cups plus some leftovers. I’m assuming it would take 2 cans as well. I found these chickpeas at the market and grabbed them as they were in these BPA free and recyclable boxes. I also use Eden Organic chickpeas which are in BPA free cans as well. If you don’t have the time to soak beans its nice to know that there are great alternatives out there that are BPA free. Isn’t the packaging cute? If you’re using sprouted garbanzos, steam them until tender, about 10 minutes. If you are using canned or boxed beans (which I did), jump right in. 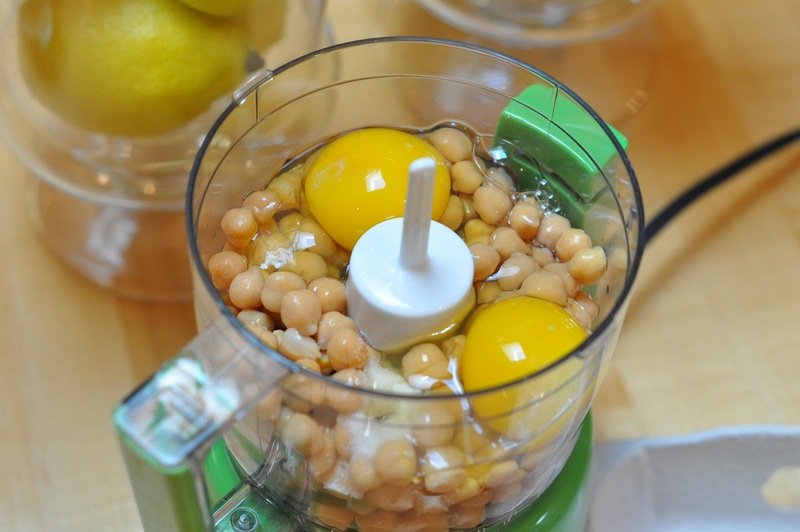 Combine the chickpeas, eggs, and 1/2 teaspoon salt in a food processor. Note: I used my mini-prep so I added 1/2 of the chickpeas and 2 eggs plus the 1/2 teaspoon salt and pureed it, and then added the rest of the chickpeas and the other two eggs and pureed it again. 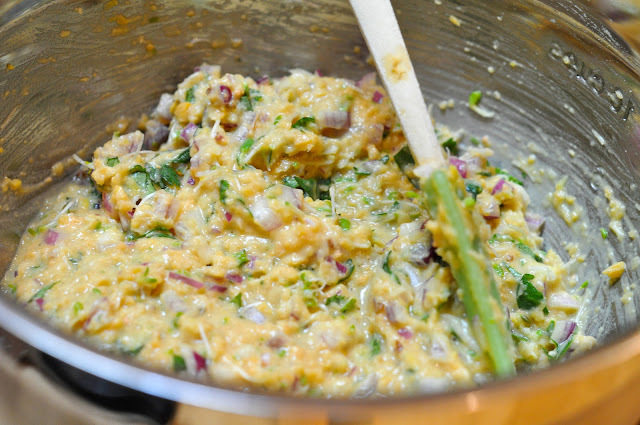 Puree until the mixture is the consistency of a very thick, slightly chunky hummus. 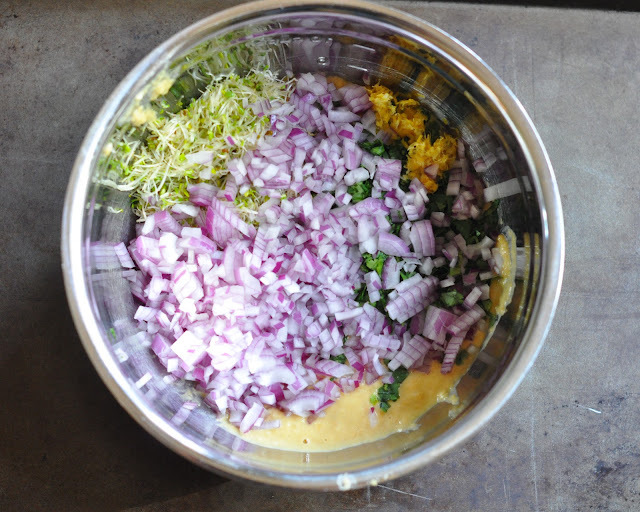 Pour into a mixing bowl and add in the cilantro, onion, lemon zest, and sprouts. Add the breadcrumbs, stir, and let sit for about 5 minutes so the crumbs can absorb the moisture. This is where I clean up the kitchen a bit. After about 5 minutes or so, you should have a moist mixture that you can easily form into patties. I formed mine into 8 hamburger-sized patties. These patties are moist but will hold their form quite well. You can always add more breadcrumbs a bit at a time to firm up the dough if needed. Heat the olive oil in a heavy skillet over medium-low heat. Add 4 patties, cover, and cook for 7 to 10 minutes, or until the bottoms begin to brown. Turn up the heat if there’s no browning after 10 minutes. Note: If you are just making one burger for lunch or dinner then just pour enough olive oil in the pan to coat the bottom and cook up your burger. The cooking time might be less per side as there is only one burger. Flip the patties and cook the second side for 7 minutes, or until golden brown. Remove from skillet and cool patties on a wire rack while you cook the remaining patties. I added another tablespoon of olive oil before I put in the rest of the patties, as I did not want them to be dry. Carefully cut the patty in half, insert your favorite filling and enjoy! I filled mine with some of the tzatziki sauce, avocado and some clover sprouts. Note: It’s recommended that this sauce chill in the refrigerator for a few hours in order for the flavors to blend together. You can even make this sauce the day before. This recipe makes a lot of yogurt sauce, so please feel free to cut it in half. This yogurt sauce is also great to use as a dip for veggies for a healthy after school snack or with pita chips. Peel and grate the cucumber. Wrap the grated cucumber in a paper towel and squeeze it to get out the excess water. You may have to re-wrap and squeeze it a few times to get out all of the water. Scoop out the yogurt into a bowl. Add the grated cucumber, 3 teaspoons kosher salt, 1/2 cup sour cream, 1 tablespoon champagne vinegar, 2 tablespoons lemon juice, 1 tablespoon olive oil, 1 1/2 teaspoon minced garlic, 1 1/2 teaspoons minced dill, and a pinch of pepper. Mix the ingredients together. 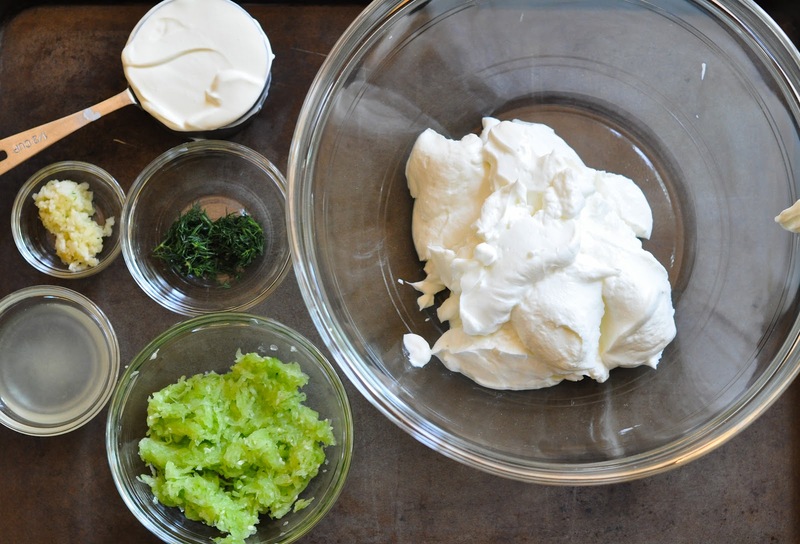 Cover and put the tzatziki in the refrigerator for a few hours so that the flavors can blend together. That’s it, easy peasy! Hubby Verdict? He loved these and was actually the one who suggested that we serve these up for dinner for our friends. This is coming from a Midwestern meat and potato guy. He has had one for lunch the past two days as well. Kids Verdict? Eli wouldn’t even try one, Zoe tried it and liked it, but could only handle a few bites! Have you ever made a veggie burger before? Do you prefer a beef/buffalo, turkey, salmon or veggie burger? Just made these for dinner. They were delicious. Light yet filling and dense. Is there anyway to bake these? This is the third time I stumbled across your website looking for recipes, so I added it to my favorites list. 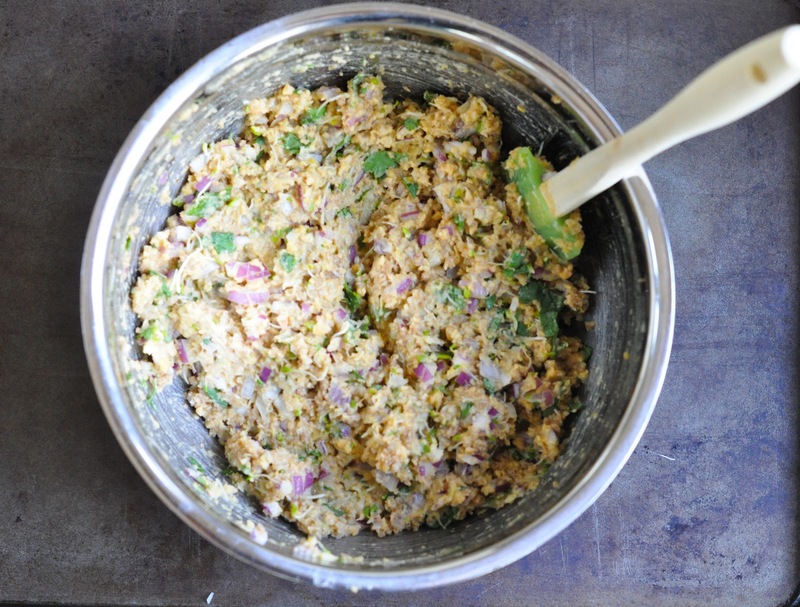 The chickpea burger is a great variation on my falafel balls that always fall apart. Thank you for the breadcrumb tip! I roll them into small balls, fry them, and put them into pita bread, add the yogurt/tahini sauce, hot sauce, and sprouts on top. My kids are all grown and moved out, so I don’t have to cook two different things anymore. This gives me more time with my chickens and horses. Wish I could send you some eggs, but PA is too far from CA. Originally from Seattle, business in NY brought our family to the east coast, but we miss the REAL mountains. I own 30 acres near Newfoundland and Lake Wallenpaupack. Got a small greenhouse for Mother’s Day last year and it really helped extend the growing season. This year we are doing some of the world’s hottest peppers, Trinidad Scorpions, so my hot salsa will have even more power! I make it from all organic produce grown here on the farm. Last fall we put up about a hundred canning jars of various tomato products! This recipe looks delicious! 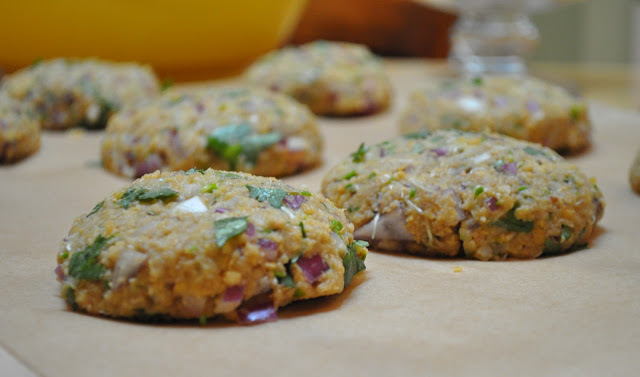 I’ve always wanted to try my own chickpea veggie burgers and can’t wait to make these! I came across your blog when researching beet and carrot juice! Congratulations on your blog! I love discovering the world of health blogs and hope to create my own healthy fun blog someday! keep blogging 🙂 <3 Love and Light <3 Thank U! I love your site! I finally subscribed to your blog. You prepare dishes that I love! Yesterday I made the kale salad (the one where your daughter is eating it out of the bowl!). It was delish! Tonight I made these chick pea veggie burgers. The hubs and I loved! Even my 17 year old son ate it although he asked why I didn’t just make a meat-burger…..he said it would be easier. Youth……Tomorrow I get a veggie burger over kale for lunch and he gets 2 veggie burgers for dinner. 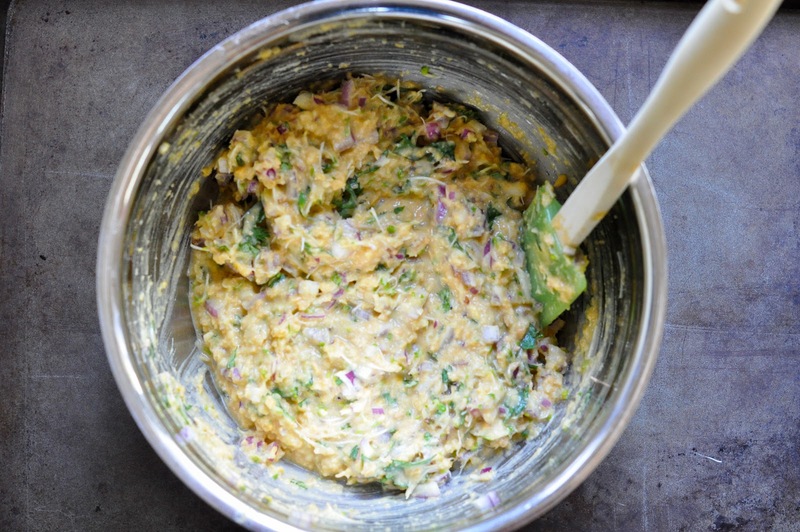 The tzatziki (sp) sauce was such a great compliment to the chick pea veggie blend! Thank you! Just found your site. Super excited about all your recipes as it seems we have very similar tastes and eating habits. Your beautiful photos and well organized blog format have kept me up now an hour past bed time. I’m looking forward to doing some meal planning mañana with your help! Loved these but mine were falling apart and were a bit dry. How can I get them a bit more moist? Thanks! Hi Pamina! They can fall apart once you start eating them as most veggie burgers do. I usually just eat mine with a fork with some of the tzatziki yogurt sauce and and avocado on top or inserted in the center. These are not burgers to eat with your hands. This was FAB.U.LOUS! I made it exactly as you suggest and served it to two 16 yr olds who don’t generally eat vegetarian (we’re encorporating a vegetarian menu each week this year) who not only gobbled it up but LOVED it! We used broccoli sprouts as those were most appealing at the market and had the Kale salad as you recommend YUM! Thank you for the wonderful recipes! My husband tried chickpea veggie burgers & tzatziki yogurt sauce at one of his friend’s place and loved it. I cooked it today it was awesome and we loved it 🙂 Thanks! Awesome! So cool that your husband tried them at a friends and then you made them up as well. I love hearing things like that 🙂 Thanks for letting me know! These look wonderful! I love easy, healthy, weeknight meal ideas…especially something that is meatfree that my boyfriend will eat! Thanks so much! Yes, when you pair the burgers with all the fixings they are really hearty and you don’t realize that they are not a meat burger! This is a little late but do you think it would be good to wrap up and take to the beach? Will it hold up? Thanks. Hi there! Do you mean sauté them up beforehand and then bring to the beach chilled or grill up at the beach? I would recommend sautéing them ahead of time and then bringing them to the beach. I would also slice them up at the beach and then insert the condiments or just top them with the yogurt sauce or whatever you were going to eat them with. They will get soggy if you insert the condiments or yogurt sauce ahead of time. I have eaten them cold topped with the yogurt sauce and inserted with some sliced avocado and they were great. Hey Cathie! Thanks for the sweet words! Your the best. Can’t wait for the gym today. You would love these burgers and next time I make them I will bring you over a patty or better yet, I will have you over here and I will make my kale salad to go along with these burgers! See you in an hour sister! Catching up on your posts this morning. This one looks amazing. I think it actually looks better than a beef/buffalo burger…makes me think I could easily be a vegetarian. But more importantly, I wanted to let you know how proud I am of you!!! You’re inspiring. It’s great to see your passion, joy and sense of fun come through your posts. Thank you!!! Oh, and I’m thinking about doing the stairs Monday morning…cardio style 🙂 Join me? Are these veggie patties or veggie buns? 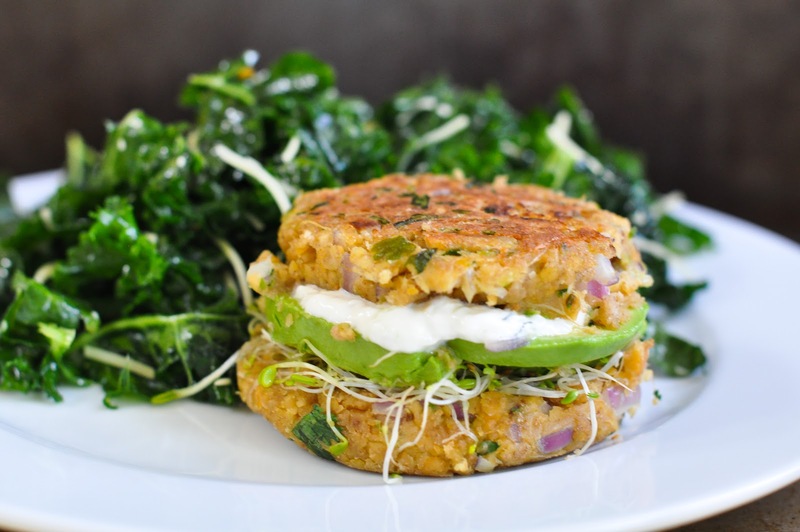 Love your genius way of making these veggie burger. I’m happy to receive my first Barefoot Contessa book. Love love love Ina’s cooking and I think she is brilliant. Thanks for your recommendation. Starting from Mar, I will be organising a blog hop event and will be using Ina Garten as my blog hop theme for the month of Apr. I hope that you can blog hop with me if you are cooking Ina’s recipes in Apr. Hi Zoe! They are both the burger and the bun. Basically they are burgers that you open up and stuff with goodies. So glad you got a Barefoot cookbook. Post your first recipe when you make it. I am posting another Barefoot chicken recipe tomorrow. What a lovely healthy recipe and they look SO full of flavor! I’m going to this one! Thanks Mary. You make up some amazing dishes as well that I am going to try very soon. I think your latest flank steak one is going to be a hit here. Thanks Jen. Let me know what you think when and if you make them! I would love to try this…I love that you are so real and say that your kids would not go for it…mine would never…ever. But it looks so good. Thanks Annie. All of my friends are salivating over these but their kids are like, no way mom. My kids are good about trying most things but some of my mommy dishes are a bit to much for them. I do always have leftovers from all the pasta I cook up so I get to eat my mommy food quite often while the kids enjoy their leftovers! You must come and visit London someday!! Will keep you posted on which recipe we do first! Hi Em! I’m making your tuna for dinner tonight as it’s easy peasy Monday at the Grandy household. Kids have sports and are home late so it’s sandwich night! I love easy nights like this. So funny how many people have made Tzatziki before. I feel so behind the times that this was my first time making it. You might be surprised as Louis might just enjoy these. I was shocked when John asked me to make them for our guests for dinner. He does not typically eat my “mommy” food. I do hear London calling! Someday! Hi Em! I loved the tuna and had it two days in a row for lunch. Mountain home Inn, is that the place you are talking about on Mt. Tam? Were not stuck in the 90’s girl, we just like our cardio and like to move. Whenever I think of 90’s cardio I think of Olivia Newton John in her “Let’s get physical” video. That was such a cool music video at the time but when I see it now, I just crack up. This is genius! I love all kinds of burgers especially the healthy ones! I’m definitely trying this recipe during the weekend! I’ll let you know how it goes! 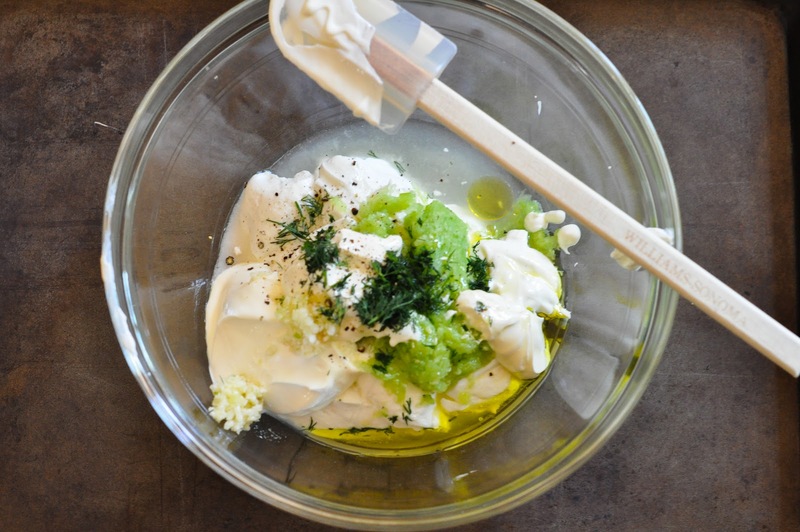 Plus I’m Greek and we always make tzatziki , even though we currently live in London! 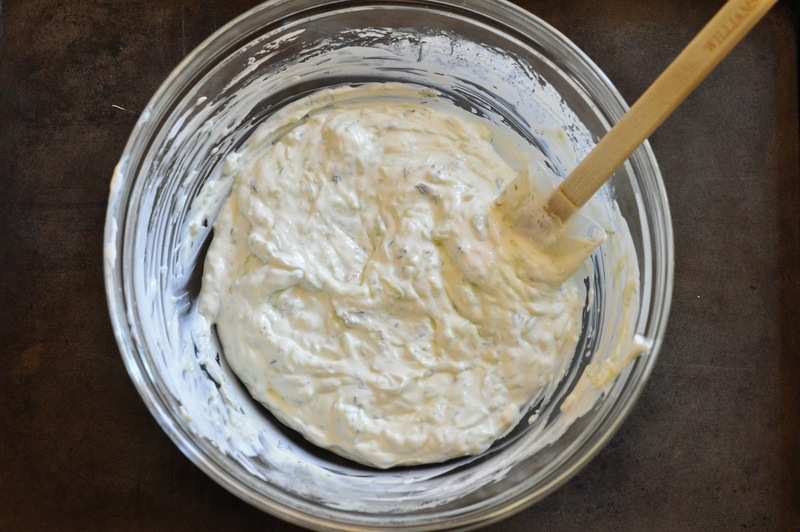 I have never made tzatziki before and it’s so flavorful. We didn’t make it exactly the way Barefoot made it (she strained the yogurt and the cucumber) but it tasted amazing and gave such flavor to the chickpea burger. I have yet to visit London and I hope to someday and it has such history and the arts and theater there are amazing! These look so tasty and healthy! ^^ The fact that you put the yummy fillings inside makes it even better and cuter! Thanks Aiko! I may start opening up all my burgers and inserting all types of goodies. I always put everything on top of a burger and then put it all beneath 2 buns but now I am going to re-think that concept and possibly make the burger the bun for now on. It looks healthy, hearty, and delicious. Your photos make these burgers look so tempting. I love all the green leafy herbs and sprouts, it looks like spring! I’m always on the prowl for a great veggie burger, thanks! Thanks Sue. Veggies make any photo look wonderful as they exhibit such natural vibrant color. This is pretty much my favorite kind of thing to eat. Looks gorgeous, yummy, and healthy !